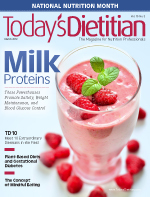 Here's an article on the importance of milk proteins in the diet from Today's Dietitian magazine.March 2013 Issue Milk Proteins: Packing a Powerful Nutritional Punch By Karen Giles-Smith, MS, RD Today's Dietitian Vol. 15 No. 3 P. 26 Evidence shows high-quality proteins, such as milk proteins, promote satiety, weight maintenance, muscle synthesis, and blood glucose control. For many years, nutrition professionals didn't consider protein a priority for most Americans. The thought was that most people...(read more on their site) http://www.todaysdietitian.com/newarchives/030413p26.shtml For help working healthy foods into your diet, check out weekly meal prep from personal chefs at www.friendthatcooks.com in Kansas City and Wichita. We'll send a talented chef to your home once per week to shop, cook, clean up and stock your refrigerator with delicious meals to last the entire week. All for an affordable hourly rate.